2015 October 04 A good night for seeing quality but frustrating for transparency with cloud forming and dispersing, in addition to moving light cloud patches on a fresh S wind. Difficult to fix an exposure time with cloud likely to intervene before completion; additionally, a number of artificial Earth satellites crossing the line of sight. Question: Why use a lens system of inferior colour correction when we have far superior lenses available? The combination of speed (f/5) aperture (150mm) and focal length (750mm) judged appropriate for the comet's distance and local conditions. This instrument is equipped with a wide-angle finder 'scope enabling us to make the initial equatorial settings faster than with a camera lens. Moreover, the images are sharp - a little colour distortion is relatively unimportant. Exposures were compromised by an all-pervading, moderate auroral glow. 2015 September 10 The first opportunity for working in a dark, clear sky for eighteen days. A NW airflow has kept skies overcast by day and night restricting observations of the Sun likewise. Quite depressing! The ringed area at its centre shows the galazy NGC 6013 magnitude 13.6, size1.4'x0.8'. Exposures were severely compromised by an intense auroral glow (see auroral page) not helped by moderate transparency and variable seeing stability. 2015 August 23. A clear sky following a day of almost clear skies but poor transparency. The nigh sky transparency slowly improved until morning twilight took over in the early hours of the 24th. A strong (force 6-7) SEE wind moderated slowly during the course of the night. Not easy! 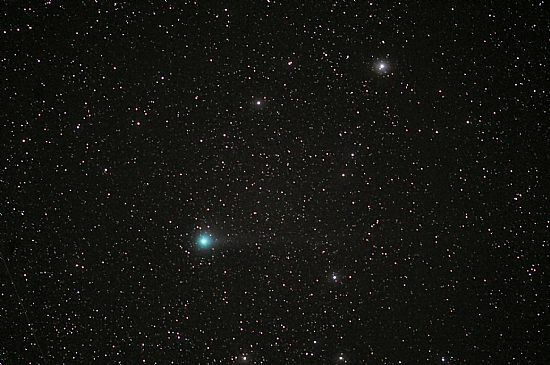 Observations of Comet C/2014 Q2 (Lovejoy) were made with both 600mm f/4 and 800mm f/5.6 Nikkor lenses in combination with the d800 SLR. High resolution images still show a short tail. 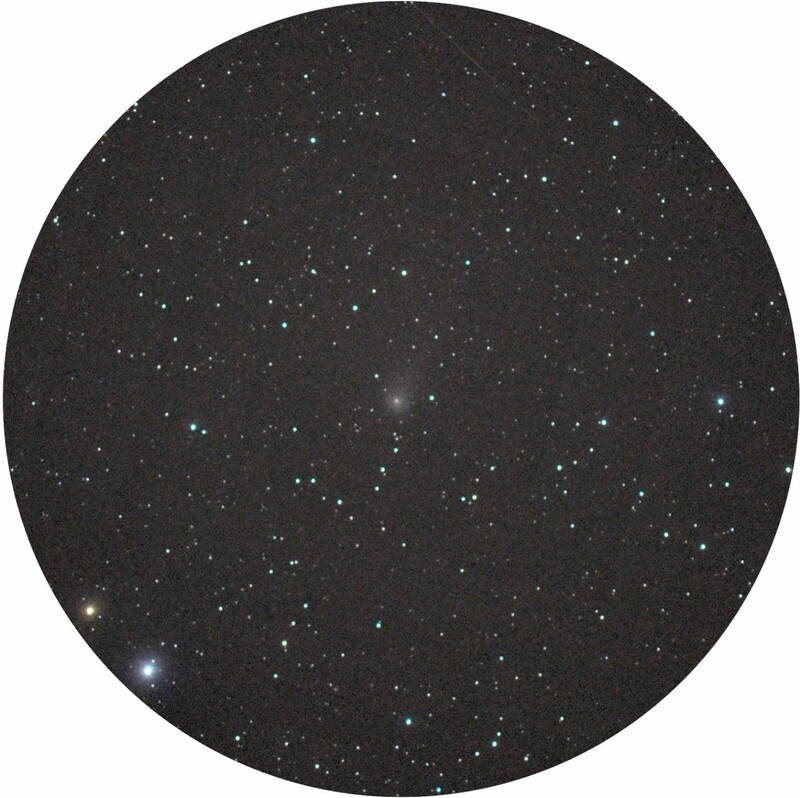 Early morning observations (Aug. 24) were conducted with the 400mm f/2.8 in Gemini in the hope of locating Comet 67P/Churyumov-Gerasimenko but without success. 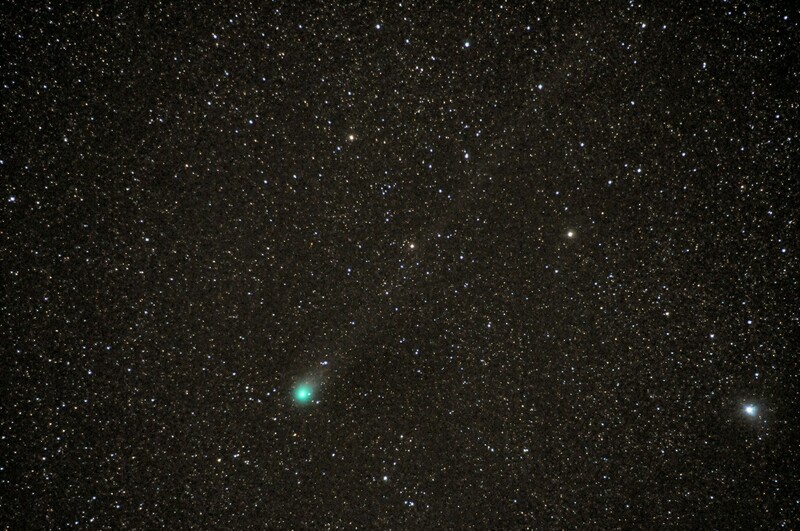 The comet was below altitude 8° in an area of growing twilight and light pollution from the ground. Images did, hovever, show stars to vis. mag. 15.5. 2015 August 16. 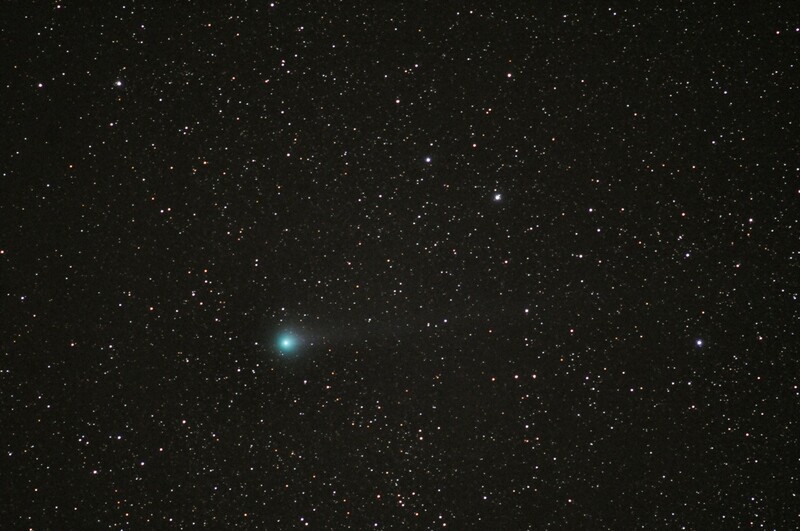 Comet C/2014 Q2 Lovejoy. A very poor night following a day of excellent transparency but deteriorating as night approach. Cloud coming and going, dispersing within seconds making for a frustrating time at the telescope with few opportunities for seeing anything! See the Gallery page for observations of August 15. 2015 August 04. Comet C/2014 Q2 Lovejoy. The galaxy to the right of the comet is NGC 5907 ("Splinter Galaxy"), integrated vis mag. 10.4, apparent angular dimensions: 12.6'x1.4'. The proximity of NGC 5907 was fortuitous, enabling one to make a more reliable estimate for the comet's own integrated vis mag. which we would put at 11.0, slightly brighter than the estimate of 2015 July 27. Conditions at time of imaging: astronomical twilight (Sun's altitude -13° 33' ). 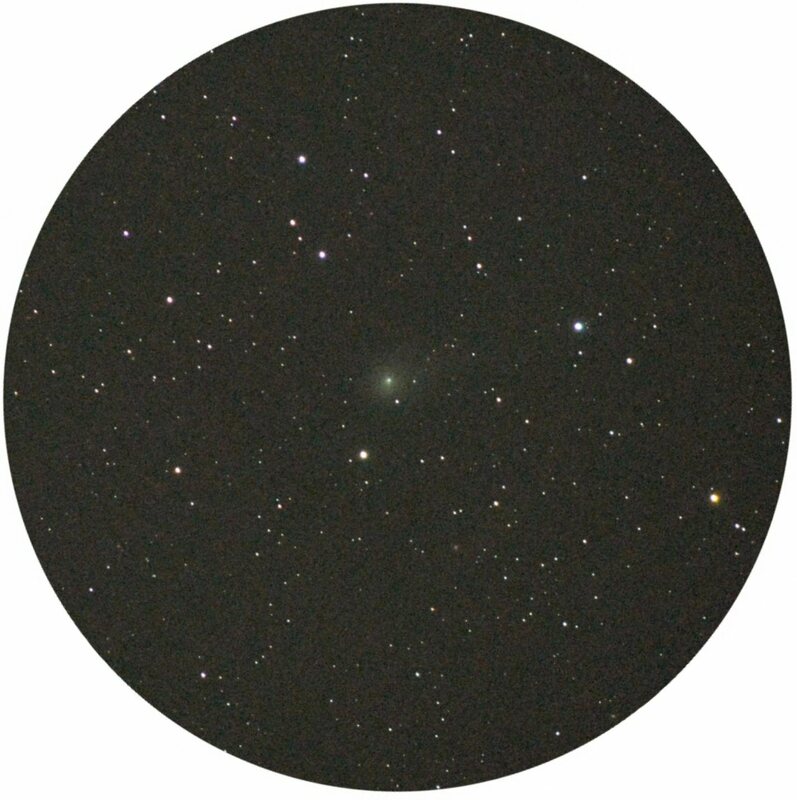 Comet's data for 2015 August 04 23h 47m UT. 2015 July 26/27. 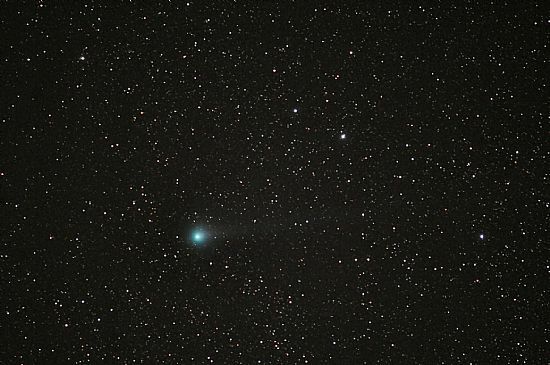 Comet C/2014 Q2 Lovejoy. The comet's integrated magnitude is difficult to assess under these conditions but is likely to be in the region of12.5 mag. 2015 May 09/10. 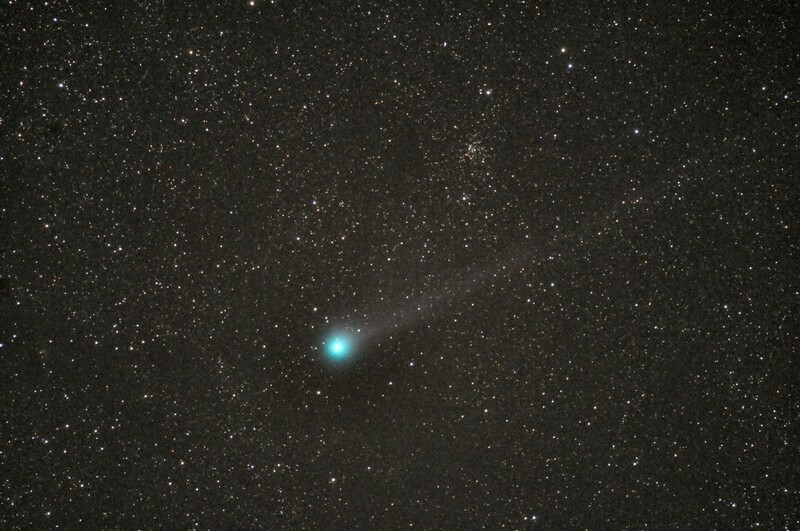 Comet C/2014 Q2 Lovejoy. The daytime of the 9th followed a similar pattern to that of the previous day, skies clearing as sunset approached and leading on to an even clearer night. 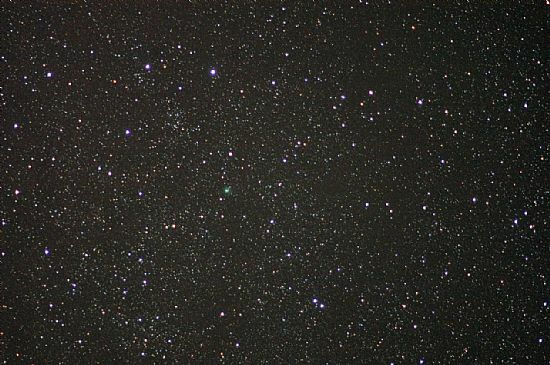 Observations for Comet Lovejoy commenced at around 23 40 UT with both Nikkor 500mm f/4 and 800mm f/5.6. Our recent night's observations (May 08 – 10) for the comet are likely to be the last until well after summer solstice. We might hope to resume work on the comet from the second week into August. More information will be given in early August. Comet C/2014 Q2 Lovejoy, 2015 May 09, 23h 49m UT. Nikkor 500mm f/4. A 66.2 sec exposure D 300 SLR, ISO 2000. The brightest star in the field (dia. 1.8°approx.) TYC 4505-894-1, vis. mag. 6.70 spectral class A0. 2015 May 08/09. 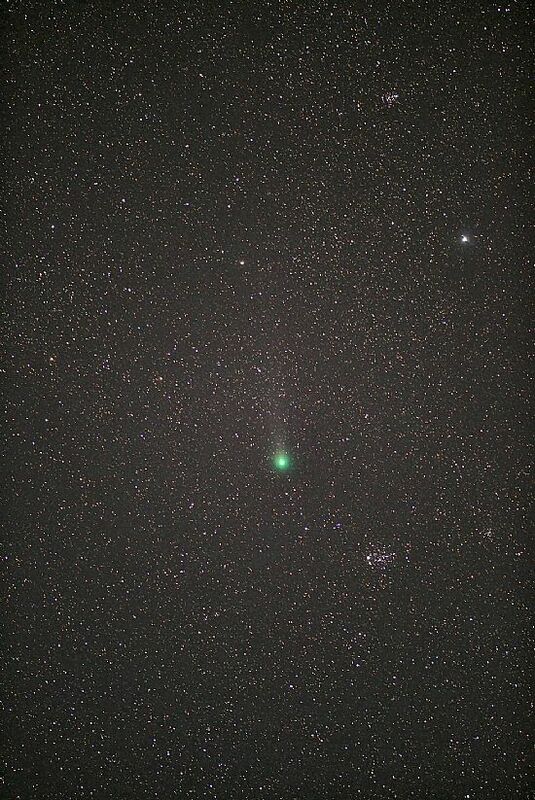 Comet C/2014 Q2 Lovejoy. 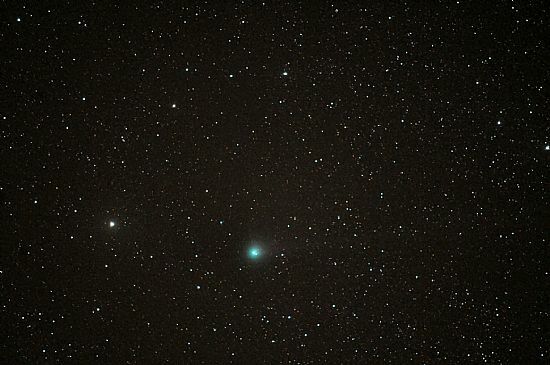 Observations re-commenced at 23 30 UT in strong twilight using the 500mm f/4 Nikkor lens and DF300 SLR to secure a number of first-class images of Comet Lovejoy. Work continued into the following morning when the Sun was 13.6° below the northern horizon close to lower transit and thereby affording the "darkest" conditions for the comet. A feature of this period of observation was the number of artificial Earth satellites passing close to the zenith with one exceeding vis. mag. –6 (over twice as bright as Venus!). 2015 April 20. 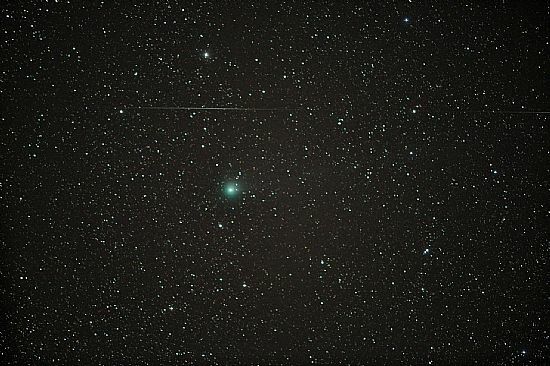 Comet C/2014 Q2 Lovejoy. A day of cloud and good, clear spells with occasional low cloud forming on and off from the hills. (Mercury observed close to meridian passage with 100mm apochromatic refractor). A cloud evening but cloud disepersing to give excellent seeing and transparency from 2230h UT to a little past midnight, when cloud started to cover the entire sky. 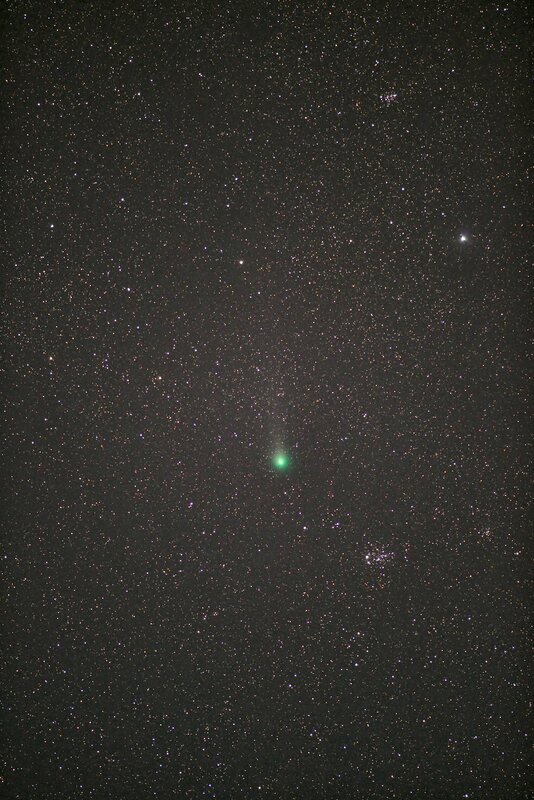 The 600mm f/4 in combination with the D800 SLR gave useful results on the comet for the first time. Additionally, the 500mm f/4 and some wide-angle images with 105mm f/1,8 and 180mm f/2.8 produced interesting images. 2015 April 20, 23h 33m UT. Nikkor 105mm f/1.8. A 55.9 sec exposure D 100SLR, ISO 600. The brightest star in the field (8.7° x 12.5° approx.) 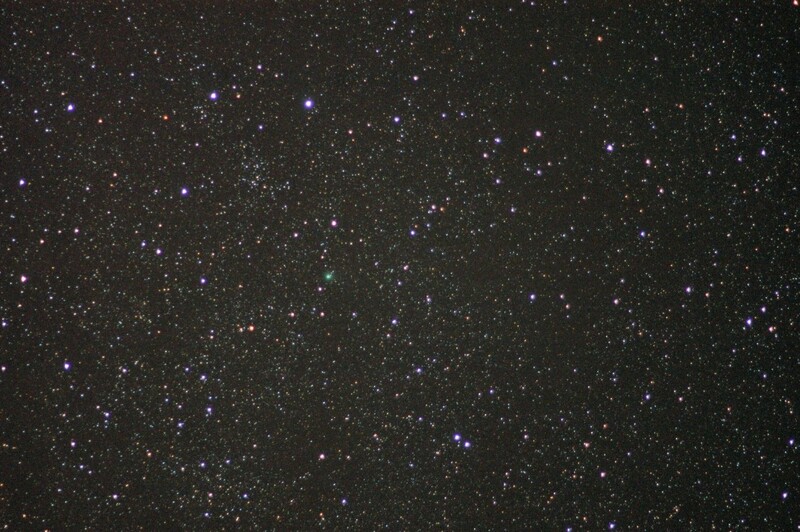 is 50 Cassiopeiae vis. mag. 3.95 spectral class A2V. 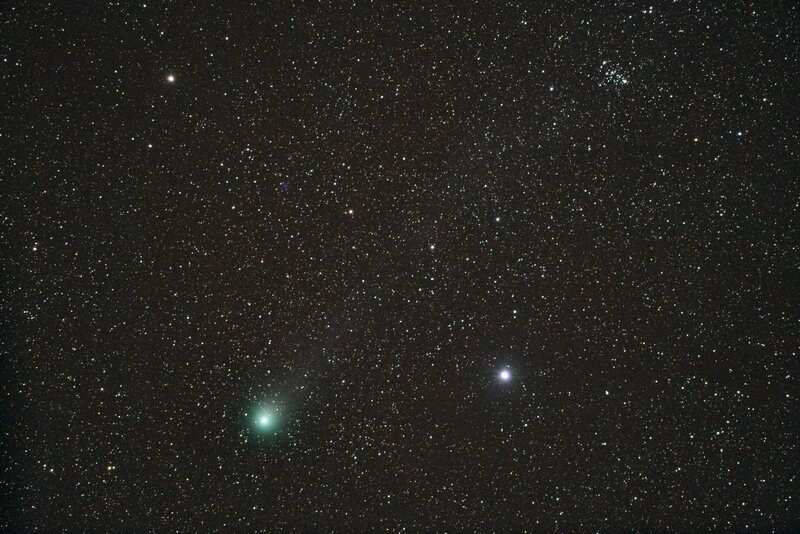 The slightly fainter star to the left of the comet is 40 Cassiopeiae vis. mag. 5.28 spectral class G8II-IIIvar (see data for imaged below). Comet:centre/left. 2015 April 20, 23h 21m UT. Nikkor 600mm f/4. A 87.9 sec exposure D 800 SLR, ISO 2500. The brightest star in the field (1.5° x 2° approx.) is 40 Cassiopeiae vis. mag. 5.28 spectral class G8II-IIIvar. Liming magnitude 17.5 approx. Note the "passing" meteor trail. A rather hazy sky but clearing in the north to make it possible to image the comet before lower transit. It will seen in the case of "brighter" stars that the transparency left something to be desired, but in contrast to the previous night/early morning, seeing was somewhat improved. 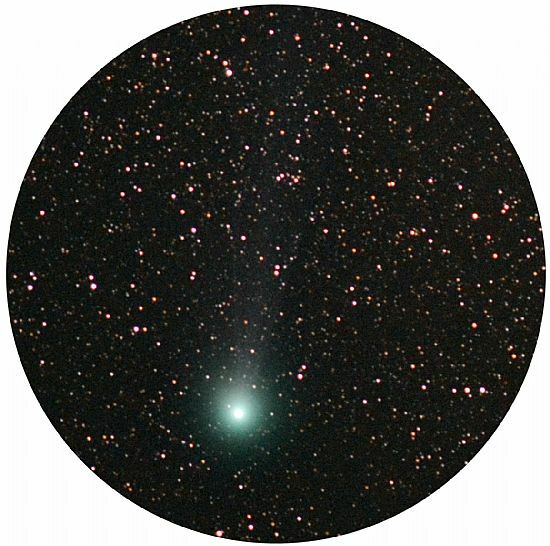 Conditions for imaging the comet will deteriorate with the Moon back in the evening/night sky together with all-night twilight (astronomical twilight lasts all night in Orkney from April 24 to August 19). It should be possible to continue observations thereafter well into October this year, by which time the comet will have faded significantly. 2015 April 17/18. 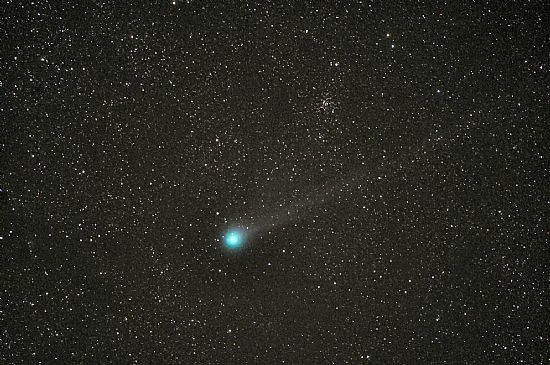 Comet C/2014 Q2 Lovejoy. A rare, clear night from dusk to dawn. Good transparency but only moderate seeing (image stability). Commenced observations at around 2230 UT but a considerable amount of time had to be spent adjusting polar alignment on the EQ6 mounting. This having been accomplished, we then faced the situation where the comet was approaching lower transit whilst the set-up stars were on either side of the northern meridian! Comet data for April 18 00h 27m UT. 2015 April 11. Comet C/2014 Q2 Lovejoy. A strong SSW wind (force 6) following a day of frequent, short-lived snow showers giving good transparency after sunset, but with heavy cloud coming and going making for tricky observational conditions. Longer exposures out of twilight show a significant tail (a little under 1°) on high-resolution images. 2015 April 09. 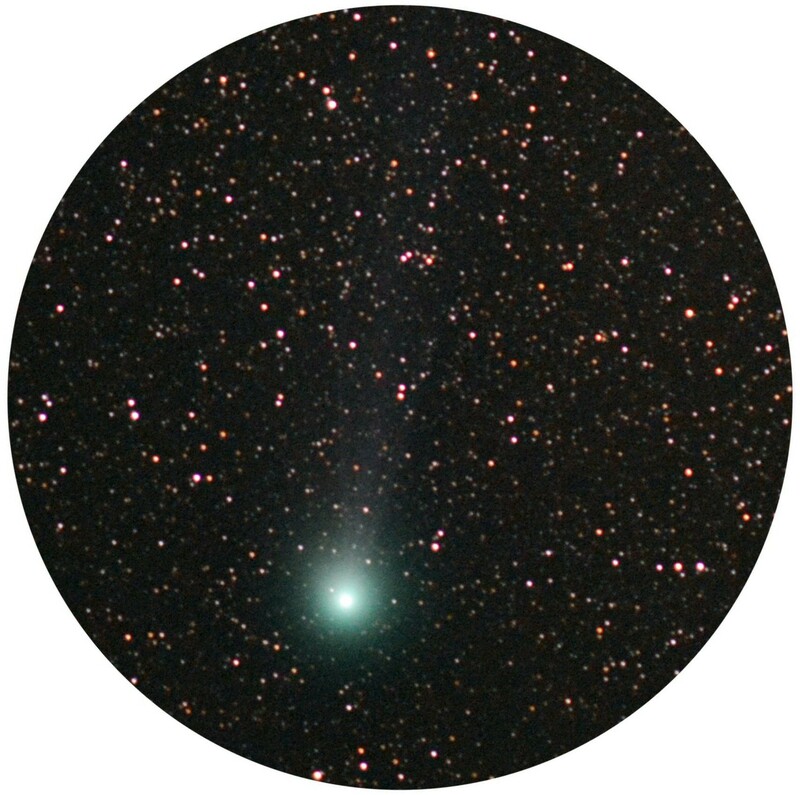 Comet C/2014 Q2 Lovejoy. Following a crop of poor weather, with hardly a break in cloud at night since March 24, it was at last possible to image the comet using the 500mm f/4, exposure times being limited by twilight and a varying degree of haze. 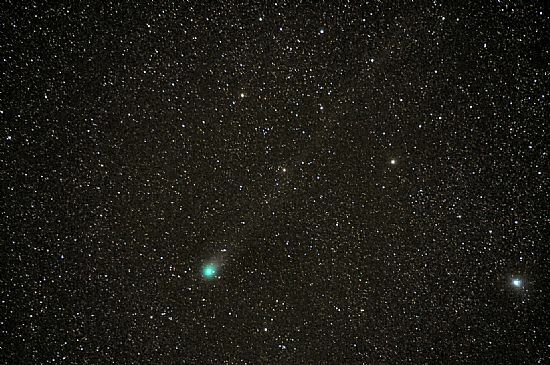 The comet will be seen to have faded a good deal and to be moving out of the plane of the Milky Way as background. 2015 March 24. 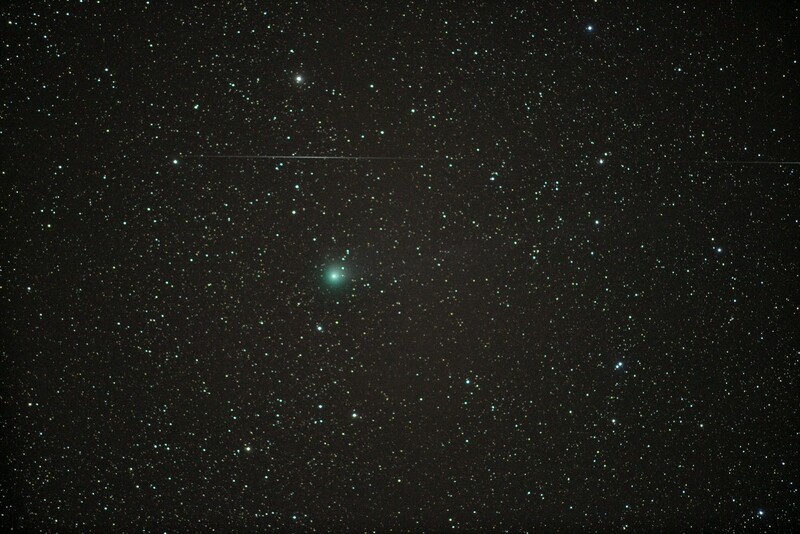 Comet C/2014 Q2 Lovejoy. A fine evening and night, clear through to dawn (a very rare occurrence in Orkney). 2015 March 24, 20h 48/9m UT. A 56.8 sec. exposure Nikkor 500mm f/4, D800 SLR ISO 2500. The brightest star in the field (dia. 2.4° approx.) is 35 Cassiopeiae mag. 6.33 spectral class A2Vnn. Considerable sky light from Moon in Taurus at phase 25.7%. 2015 March 23. 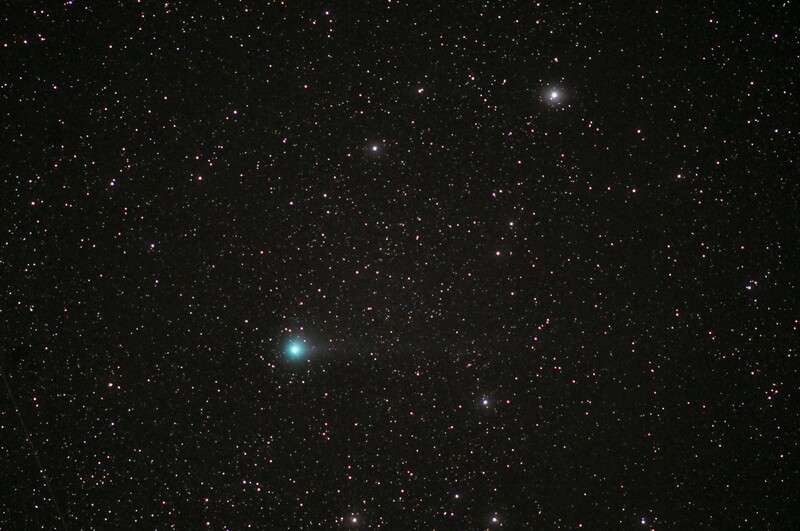 Comet C/2014 Q2 Lovejoy. The first opportunity to observe the comet since 14th March. The Moon "fresh" from the recent solar eclipse is now beginning to dominate the evening and night skies again. Both moonlight and twilight gave far from ideal conditions and this, coupled with fast moving, light cloud set something of a challenge. 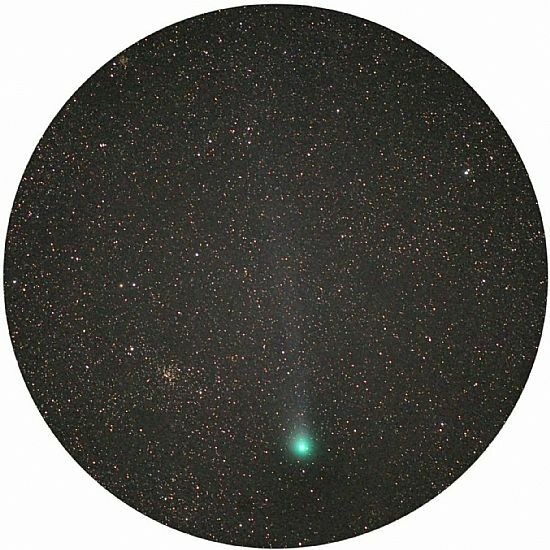 Despite the conditions, the comet continues to show a substantial tail. 2015 March 23, 20h 48/9m UT. A 61.4 sec. exposure Nikkor 500mm f/4, D300 SLR ISO 2000. The brightest star in the field (1.8° x 2.7° approx.) is the variable star V636 Cassiopeia mag. range: 7.09 to 7.26 spectral class G0Ib. 2015 March 14. 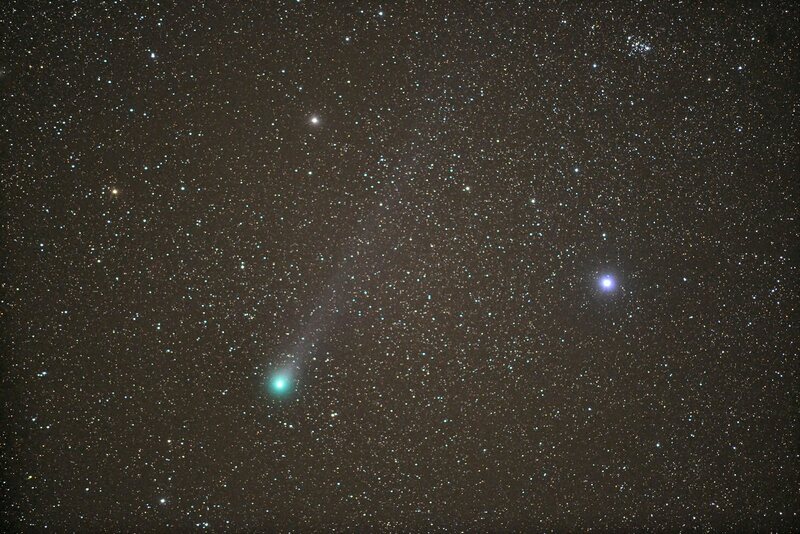 Comet C/2014 Q2 Lovejoy. A cloudy day after a bright start but clearing towards sunset and leading to a fine evening and night offering, again, the best transparency in months. Work was restricted to the 500mm f/4 and 200mm f/2 lenses in order to capture both detail in the short tail (difficult against the background of the Milky Way) and wider angle to show the two open clusters NGC 457 and M103. A day of sunny intervals in complete contrast to yesterday and leading to a fine evening and early night offering the best transparency in months. This enabled us to use larger (longer focal length), slower lenses with appropriately longer exposures, well in excess of two minutes in some instances. Transparency was 7/10 and so relatively long exposures* were required, leading to some "fogging" of the brighter stars. 2015 March 11. 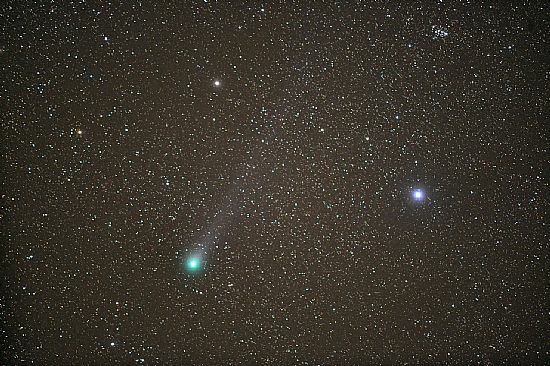 Comet C/2014 Q2 Lovejoy. By 21. 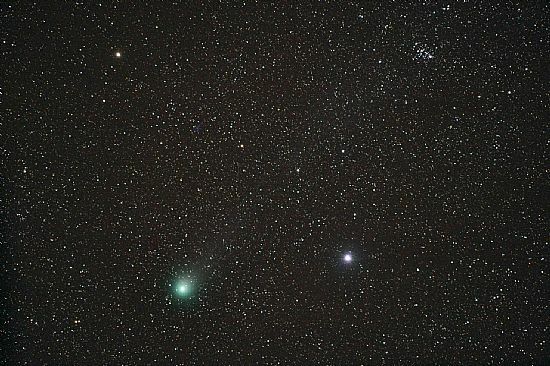 30h UT the wind had eased to a mere force 4 and so it was considered worth attempting imaging the comet with the 600mm f/4 lens, in addition to the 300mmf/2.8 and 200mm f/2. 2015 March 11, 22h 00m UT. A 79.6 sec. exposure (Nikkor 600mm f/4) D800 SLR ISO 2500. The brightest star in the field (1.5° x 2° approx.) is the variable star delta Cassiopeia, mag. range: 2.68 to 2.76, spectral class A5Vv SB. Limiting mag. 18.0. The open cluster (top right) is M 103. 2015 March 10. 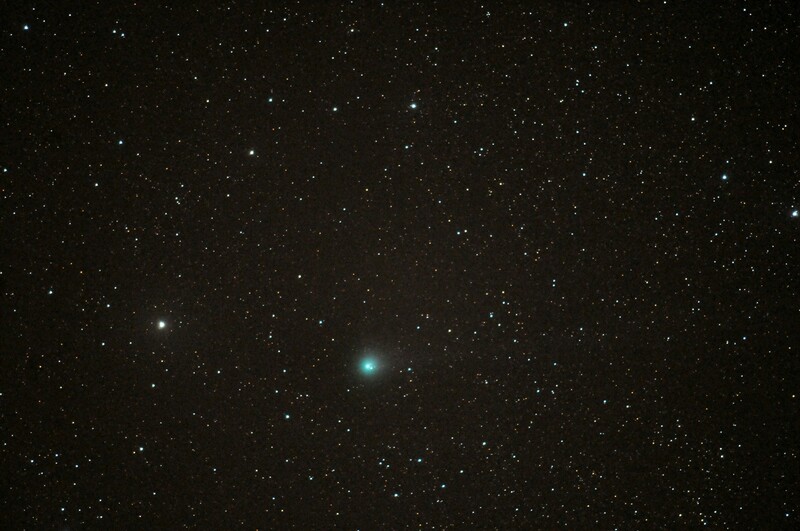 Comet C/2014 Q2 Lovejoy. 2015 March 10, 19h 46m UT. A 26.1 sec. exposure (Nikkor 400mm f/2.8) D800 SLR ISO 2500. The brightest star in the field (2.3° x 3.4° approx.) is the variable star delta Cassiopeia, mag. range: 2.68 to 2.76, spectral class A5Vv SB. Limiting mag. 17.5. The two open clusters are, from top to bottom: M 103 and NGC 457. 2015 March 10, 20h 59m UT. A 42.7 sec. exposure (Nikkor 500mm f/4) D800 SLR ISO 2500. The field diameter is 54' approx. 2015 March 08. 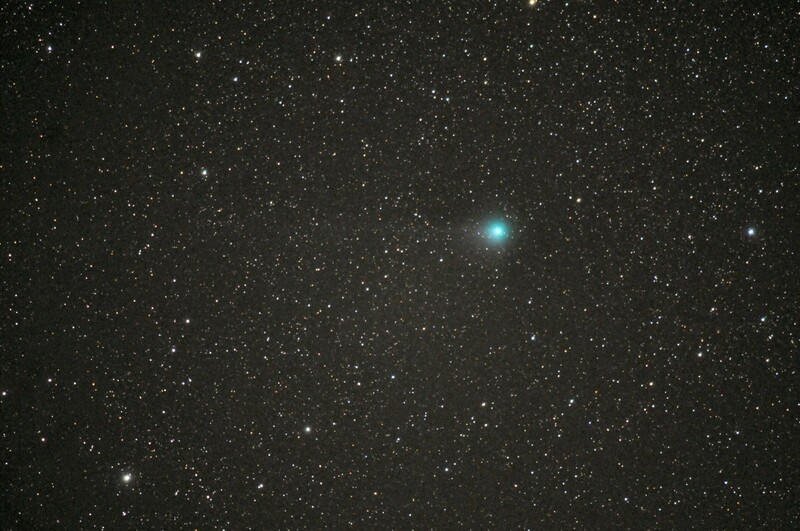 Comet C/2014 Q2 Lovejoy. A brief spell of clear sky before moonrise. Cloud readily forming with thicker cloud advancing from the south. Wind force 4 to 5 and increasing. 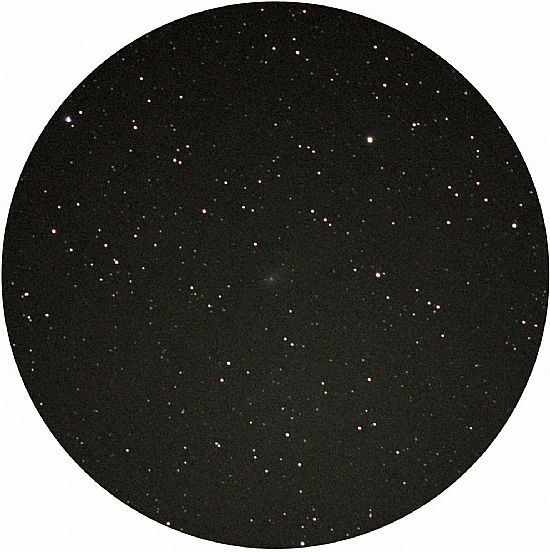 Far from ideal but the first opportunity of imaging the comet since full moon on March 5. Again limited observations to Tokina 300mm f/2.8 and Nikkor 500mm f/4. 2015 March, 08, 19h 50m UT. A 42.9 sec. exposure, Tokina 300mm f/2.8) D300 SLR ISO 2000. The brightest star in the field (2.7° x 4.6° approx.) is the variable star delta Cassiopeia, mag range: 2.68 to 2.76, spectral class A5Vv SB. Limiting mag. 17.